Stonados out on DVD next week originally aired on the Syfy network in November of last year. It was suppose to air in early 2013 but because of the Boston Marathon bombing was delayed. 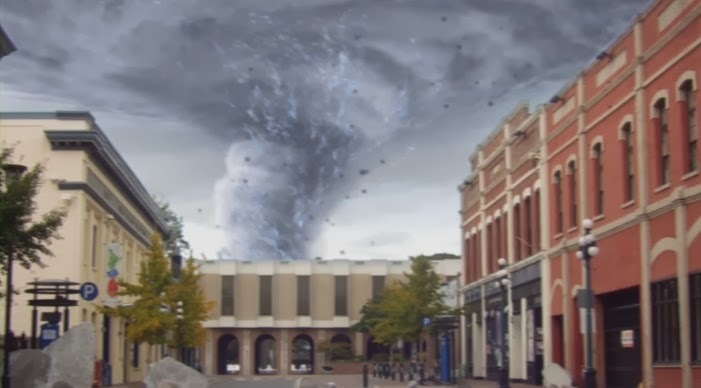 Stonados which did not received the viral cult status that Sharknado did, is at least on par if not better than its Syfy fellow disaster movie. 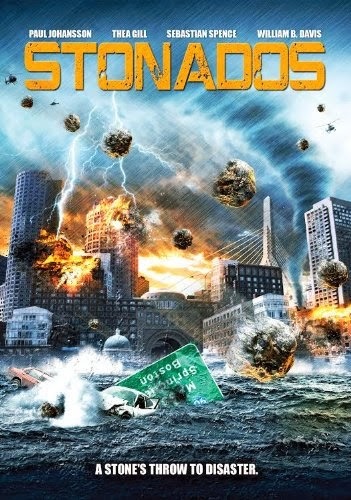 Stonados is about an abnormal storm that creates Tornados in the Boston area that tosses rocks made of unstable material that explodes. What separates Stonados from Sharknado in a good way is the level of quality of actors in Stonados. From Queer as Folk's Thea Gill to X-Files's William B. Davis, the acting stands out more even if the scenario is implausible if not outright ridiculous. There are exceptions however which includes Sebastian Spence as Lee Carlton. Sebastian's character is quite easy going but having him permanently stuck on "smile" throughout the first half of the movie was just unnerving. 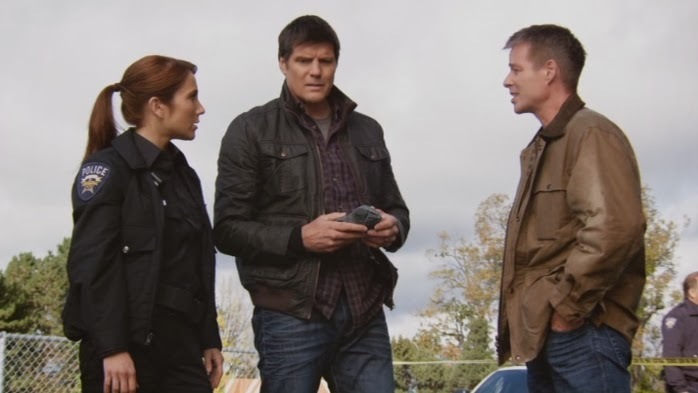 Paul Johansson does a convincing job in his role even if the lines he are spouting are not believable. What father brings their children closer to danger in the form of a Stonado??? I would have loved a bigger role for Miranda Frigon as Maddy instead of just a token of a side romance story. As with any disaster movie, it's all about the special effects and while it is a step up from what you see in Sharknado, it's still far from any blockbuster movie movie given their budget constraint. Despite what you would expect as terrifying damages wrought by strong tornadoes with exploding stones no less, the damages shown to the city infrastructure is miniscule. In addition, with explosions and rocks smashing down into people you would expect to see a lot more bloody parts and gore. Instead, the film is amazingly clean of serious injuries, or deaths that conveniently destroys the whole body leaving just a shoe. Overall, I would recommend this film only if you're a huge fan of disaster movies and are not so swept into the details of if the science works or not. For those of you expecting CGI like The Core or Day After Tomorrow, you'll be disappointed given the vastly different budget that the films have to work with. But if you're looking for a fun, end of the world (or at least Boston) film, than pick it up at Amazon beginning January 28th here. Fraser Corbett as Swan Boat Op.